This class provides students the opportunity to learn about the importance of phenomic data in phylogenetic research by performing individual projects designed and supervised by the instructor. Through the individual projects students learn concepts of taxonomic classification (e.g. species concepts, hierarchical classification) that are the foundation of different disciplines in Biology. Parallel to theoretical lessons, students are introduced to new computational approaches (e.g. Natural Language Processing, NLP) that enable the assemblage of large phenomic datasets from taxonomic descriptions. Click here for the Spring 2016 syllabus. This class is a bridge between two research projects of the instructors which provides an opportunity for students to participate in original, collaborative research and contribute to a broader research effort.The software programs that extract the data from the text and converts it into a matrix were recently developed through a collaborative research grant (“NSF-AVAToL: Next Generation Phenomics”). These programs are still in a beta-version and students can test and suggest changes to the programs as part of the participation in class. Presentation of the project conducted in class during the Botany 2016 meeting. The data generated by students through individual projects is novel and will be used in another ongoing research grant (“NSF-Building a Comprehensive Evolutionary History of Flagellate Plants”). During the first semester taught, the class generated data for the Gymnosperms that encompass ca. 1000 species for the “NSF-Building a Comprehensive Evolutionary History of Flagellate Plants project”. 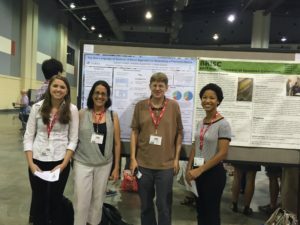 Students presented their results in the Botany 2016 meetings and received two competitive travel grants. Botany2016_poster.